This workshop is specifically designed for motivated individuals and team leaders of groups that wish to become more active in undertaking predator pest control and their local conservation areas. 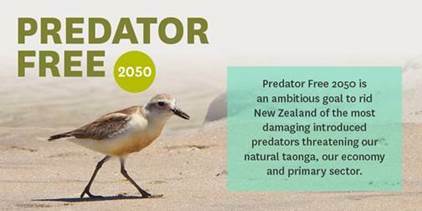 This conservation workshop aims to provide an overview of New Zealand pest predators, focusing on rats, stoats and possums. You will look at defining why these predators are pests, their impacts and control methods. The main focus will be on developing an effective predator control plan for your area and the importance of monitoring. This course allows you to work out the right methods to match the outcomes you are looking to achieve. You will also gain the practical experience you need to be able to trap successfully. This course has a good balance between classroom theory and a short field component where the participants get to handle and set DOC200 and GoodNature A24 traps. A range of other traps are discussed and demonstrated. The course would be suitable for people wanting to set up a new predator control programme or those wanting to review their current programme.